February 22, 2017 … is it here at last? Since my last post, summer has mostly continued to elude us, even as some of you in the Northern hemisphere report signs of spring. Whenever there is the slightest hint of a reasonable day, I am out looking for photographic opportunities. I still like to explore streets in unfamiliar suburbs to see if there is what town planners call a “view-shaft” – a place where there is a clear view of the surrounding landscape from the street. Sadly, they are rare, and all too often, the gap between adjacent houses is obstructed by fences or plantings designed to keep the view exclusively for the owners. This sudden wide view-shaft is in Porirua near Titahi Bay. 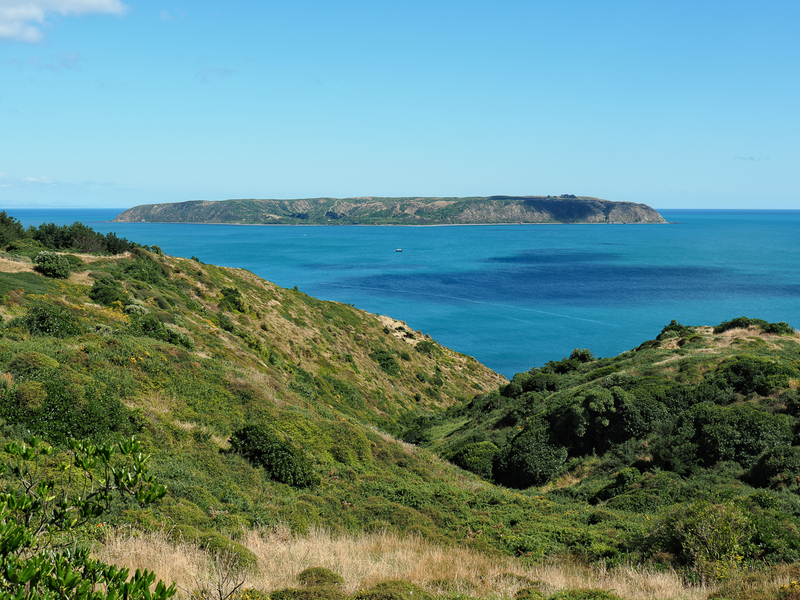 It looks out onto the blue Tasman Sea and Mana Island. If you get the chance of a trip to the island, take it. It is much more interesting and varied than it looks from the distance. 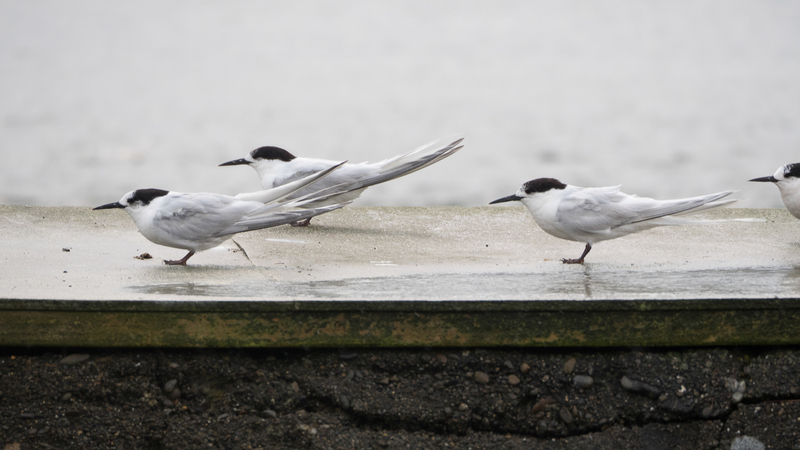 We have had some fierce winds recently, and that often drives the white-fronted terns to seek shelter. These were huddled on the remnants of the old patent slip in Evan’s Bay. The contours of the walkway and various walls provided little relief from the wind, and you can see from their posture that the birds are rocking in the gale. Another sunny break and I went into town. 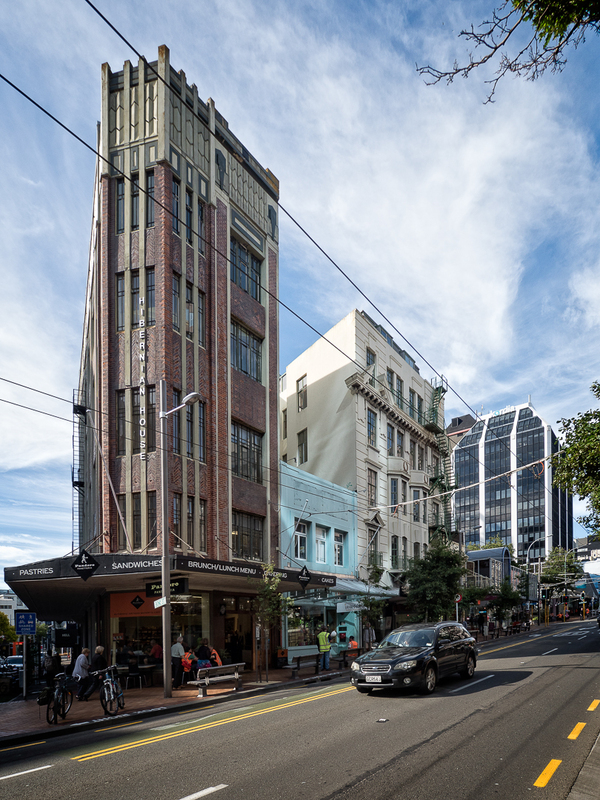 I had some shopping to do on Willis St, and was attracted to the Hibernian Society’s building on the corner of Bond Street. Perhaps it was aided by the wide angle lens, but it occurred to me that this was a miniature flatiron building. Then we had an impossibly perfect day. If you have been part of my journey for a while, you will know that mere sunshine is insufficient. I want flat calm, total stillness. I had just turned onto the Esplanade at Petone and I caught sight of the interisland ferry Kaitahi leaving harbour. 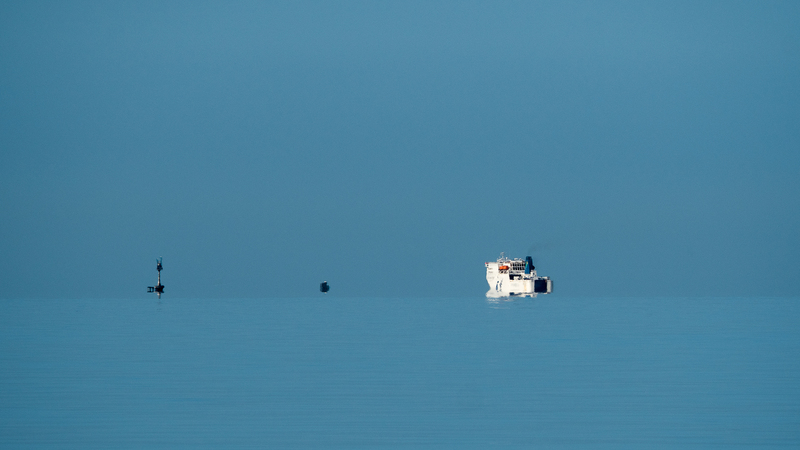 The blue of the sky and the blue of the sea were so close as make the ship seem to be floating in space as it passed by the various lights and marker buoys on the way to Picton. 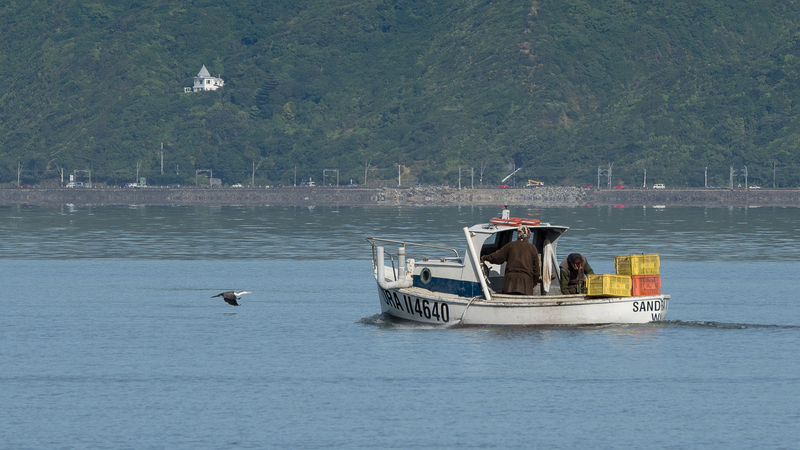 On Port Road, near the Seaview oil terminal, I found myself keeping pace with the little fishing vessel Sandra II. I have often caught her as part of a still seascape, but she was heading out to work. The pied shag skimming towards her was a bonus. 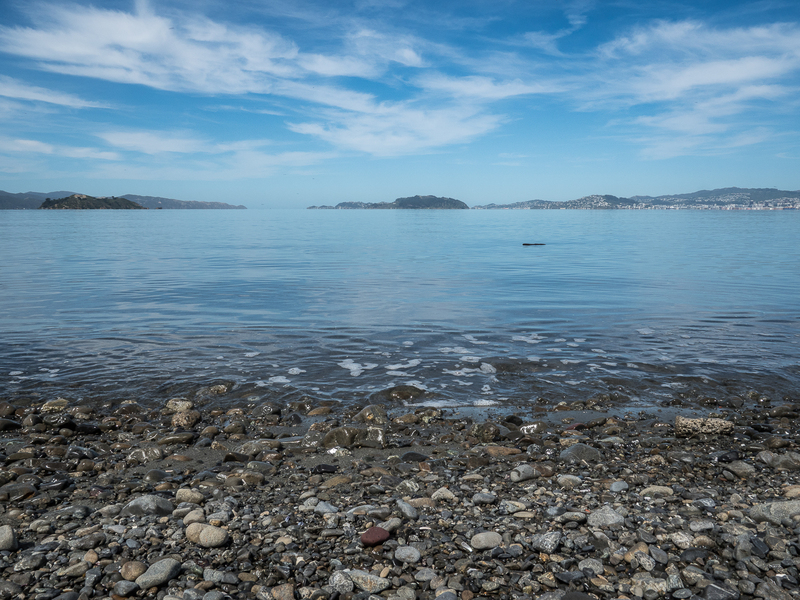 A day later, I came to the beach at the Western end of Petone, and miraculously there was still calm water. Three consecutive still mornings has been a rarity lately. This one was accompanied by river mist. 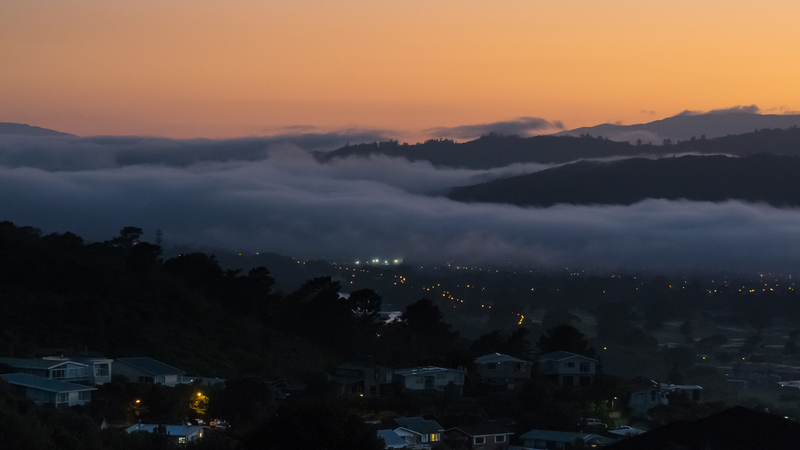 The shot is looking North from my bedroom window towards Upper Hutt. On a clear day the Boulcott golf course and the Avalon tower would form part of this view. Four from four was a reason for celebration. I wandered around the waterfront and made yet another attempt at the downtown architecture, choosing a wide angle, and long exposure. The long exposure softened the clouds and stilled the few ripples on the water. Retirement suits me well. I spend much of my time out making pictures, or at home organizing and refining my pictures. This blog provides me with a platform from which I can indulge my passion for improving my photography and at the same time analyze my thoughts about what I have seen, where I have been and what is happening in my life. My images set out to be honest, but that does not mean I have not adjusted them. I use software to display what I saw though the viewfinder to best advantage. My preference is for landscape and nature, and is mostly centred around my hometown of Wellington, New Zealand. 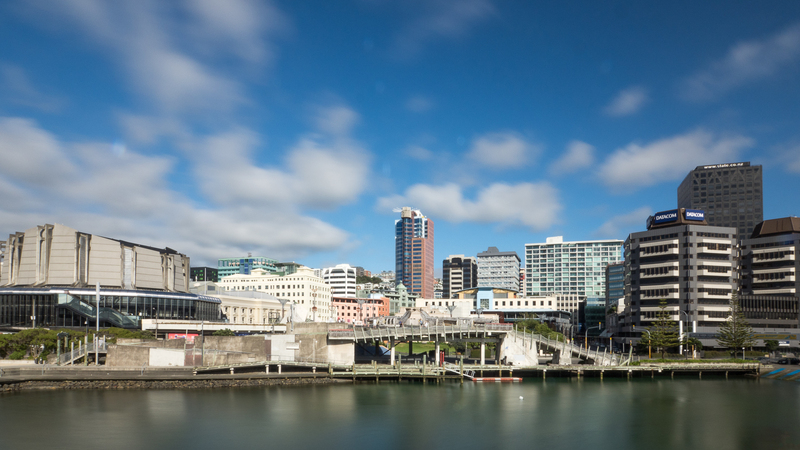 This entry was posted in Architecture, Birds, Landscapes, Maritime, Rivers, sunrise, Weather, Wellington. Bookmark the permalink. 7 Responses to February 22, 2017 … is it here at last? Glad you are enjoying our “Summer”! You can’t beat Welly on a sunny day! Brilliant photos. Especially enjoy “River mist at sunrise.” The view with clouds, mountains and fog in the intervening valleys is one of your “themes” I like the best. I was fascinated by the last photo. You used a “long exposure” to soften the clouds, etc. I am amazed that the people in the photo did not appear to be moving. I expected some sort of double image kind of thing. As you can see, I am NOT a photographer. I suppose the “long” exposure wasn’t VERY long. Or did you have to go back and doctor the people? Ahhhh… that makes sense. Although I am still puzzled – why would the kids disappear? Why not appear as a blurred movement? I guess I need to go read about such things.